Even with large, detailed environments, loading times may be a thing of the past. Whether you're taking your first tentative steps into a game's first dungeon or rushing towards an action-packed finale, nothing kills the sense of immersion like a 30-second loading screen that brings gameplay to a grinding halt. It's a necessary evil as old as gaming itself, but that may not be the case for much longer. CD Projekt RED, developers of the The Witcher 3: Wild Hunt, boast that their upcoming game won't be bogged down by long loading times - or any loading screens at all. Pawel Sasko, quest designer for Wild Hunt, confirmed that Geralt's monster-hunting career won't be interrupted by hardware limitations. 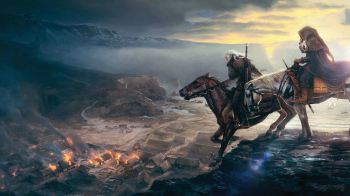 "Players will be able to traverse the world of The Witcher 3 with no load times thanks to our software and the availability of more powerful hardware by the time of release," he claimed. The "powerful hardware" in question likely refers to the processing capabilities of the PlayStation 4, though it's hard to guess how well the promise will hold up on older PCs. CD Projekt has previously estimated that The Witcher 3's game world will be roughly 20% larger than that of Skyrim, so realizing that much content without resorting to loading screens would be quite a technical feat. The increase in technological power that the next generation of consoles will bring has more than just CD Projekt excited. Ubisoft hopes to harness the capabilities of new consoles to achieve the same zero-load-time benchmark with their upcoming Assassin's Creed IV, which also aims for seamless free-roaming. It's anyone's guess as to how exactly these software magicians are going to completely eliminate waiting times - after all, new game data has to be loaded in at some point - but next-gen consoles probably provide an attractive set of new tools for them to experiment with. Whether we'll notice these shortcuts (through an abundance of pop-ins or something similar) remains to be seen. The Witcher 3: Wild Hunt is set to release on the PlayStation 4 and PC, and will likely make its way to Microsoft's next console as well.